One method is to try and buy a business trading on a low valuation and sell it when the valuation rises. This is known as a ‘value-based’ approach and some investors we admire employ this technique very successfully. However, it's not our style. We prefer to pay up for high quality businesses with strong growth prospects, and once we have found them we seek to hold their shares for the long term. First and foremost, a ‘value-based’ approach isn’t a style that suits us. Our skill set is much more suited to identifying great businesses that are likely to stay great, rather than businesses with room for improvement. When buying businesses which are going through tough times for what you might think are bargain prices, it can be easy to underestimate the challenges these businesses face in turning around their fortunes. Secondly, time is the friend of the wonderful business and the enemy of the mediocre. A company that isn’t growing or is in decline is getting less valuable every day, so timing the entry and exit becomes very important. By contrast, a good business that’s growing its profits becomes more and more valuable as the years go by. If we’re right about the quality of the business we can let compounding work its magic without overly worrying about changes in valuation or getting our timing slightly wrong. This approach also minimises trading costs. An investor who looks to benefit from valuation changes will typically sell as soon as their estimate of ‘fair value’ has been reached. They then have to redeploy the proceeds into another business. To us this is a more difficult and costly way to go about things than just holding good businesses for years. Lastly, value investors need to be very careful to avoid what’s known as ‘value traps’ when analysing businesses which may look undervalued. If a company is trading on an unusually low valuation, it may be because sentiment is irrationally depressed (a potential opportunity) but more often than not it’s a sign of deep-rooted problems. We think the UK stock market is filled with potential value-traps right now owing to the speed with which digital business models are disrupting traditional incumbents. The most obvious example is the impact of e-commerce on high street retailers but there are many others (see Steve’s recent article on digital disruption). Our focus on quality businesses with strong growth prospects naturally steers us away from such situations. Changes in valuation do have an impact on stock market returns, especially in the short term. But, over longer periods compound growth in profits has by far the bigger impact. Company A grows at 2% per year and its valuation increases from a P/E of 15 to 20. Company B on the other hand grows faster, at 10% per year, but sees its valuation fall from a P/E of 20 to 15. Source: HL. This illustration is an example. 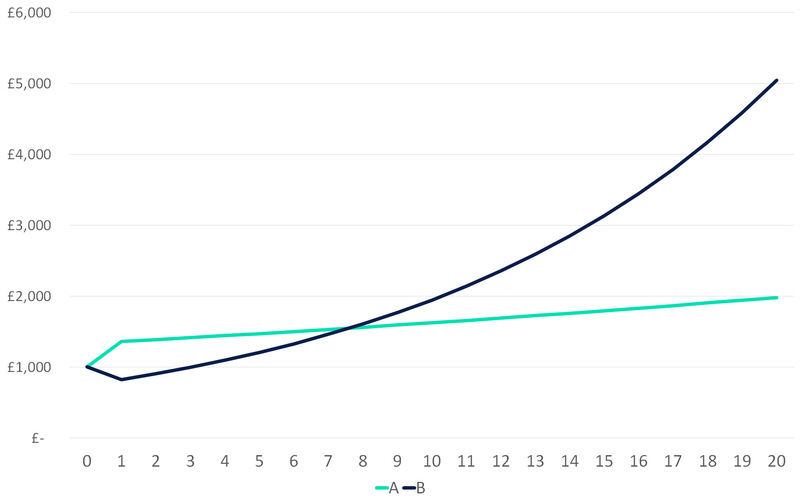 Company A, the slower growing firm, starts off as the better investment because the impact of valuation overcomes the effect of slower compounding. However, the difference in monetary terms is reasonably small. In our experience investors often get too hung-up on short term valuation changes and underestimate the power of long term compounding. This means great businesses can trade on lower prices than they really should. Take Unilever, for example. It’s out-performed the FTSE All Share by a wide margin over 5, 10, 15, 20, 25 and 30 years, although past performance isn’t a guide to future returns. In a so-called ‘efficient’ market this shouldn’t happen. It suggests that Unilever shares have been undervalued over the last three decades. In other words, investors consistently underestimated its future cash flows, despite the inherent predictability of its business model. It may seem odd to suggest that the best businesses in the stock market are often undervalued – surely investors would be clamouring for these stocks? One reason for this is that investors are naturally reluctant to look more than a few years ahead when forecasting growth in a company’s ability to generate cash. It’s understandable because most companies have tended to perform well in bursts but revert back to a relatively consistent average over time. However, some exceptional businesses, like Unilever, have defied the odds although there are no guarantees this will continue. Our job is to try and identify businesses like this with sustainable competitive advantages, where investors underestimate their future prospects. It’s not straightforward, and we won’t always get it right, but on average we believe it’s a winning approach. Finally, many investors nowadays have very short investment horizons. The average holding period for stocks trading on the New York Stock Exchange, for example, has declined to an astonishing 8 months. In fact I would go so far as to say that a long term investment horizon, measured in years not months, is one of our biggest advantages.